Floods, criminals, carnivorous animals, extreme weather. These were some of the dangers Penrith Dad (and World Bicycle Relief fundraising ambassador) Reason Wafawarova, encountered on his daily 16km school journey when he was a child in Zimbabwe. This Fathers’ Day, we salute Reason who fundraises for World Bicycle Relief Australia, a charity that delivers sturdy, all-terrain Buffalo Bicycles to children who live long distances from their school in Sub-Saharan Africa. 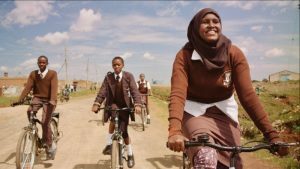 Reason is working alongside World Bicycle Relief Ambassador and Central Coast father of two, Ben Gove, to change lives through The Power of Bicycles. Growing up in Australia, the only challenge Ben faced on his way to school was the odd swooping magpie – a stark contrast to the daily struggles faced by kids in Africa. The provision of Buffalo Bicycles to students has a measurable impact. A school student can cover four times the distance, and for every 10 miles, three hours of time is saved on a Buffalo Bicycle. Students who have access to a bike have increased school attendance by 28%, and their academic performance has improved by 59%. Even when Reason was punctual, the exhaustion made learning difficult. “I used to be tired and hungry, resulting in dozing off and lack of concentration in class,” he said. Reason would not only run to school to avoid being late, he would run as fast as he could to avoid encountering dangerous animals or criminals as well as having his feet burn from the freezing or hot temperatures. Once, he was even swept away in a raging flooded river, but was rescued and revived. His journey home was under the same circumstances and would be followed by hours of laborious chores, often involving yet more running. “By saving precious time and energy each day, a Buffalo Bicycle helps more children to finish their education and have a chance to improve their lives,” Reason said.